Hometown: Somers, NY- a small town in Northern Westchester County known as the "Cradle of the American Circus." Select Credits: Chris Tyler in #HASHTAG: A Performance Art Performance (PRELUDE.13), Backup Dancer in Janelle Bonae Ramsey's FAM3 WH0R3 (Total Rejects Live! 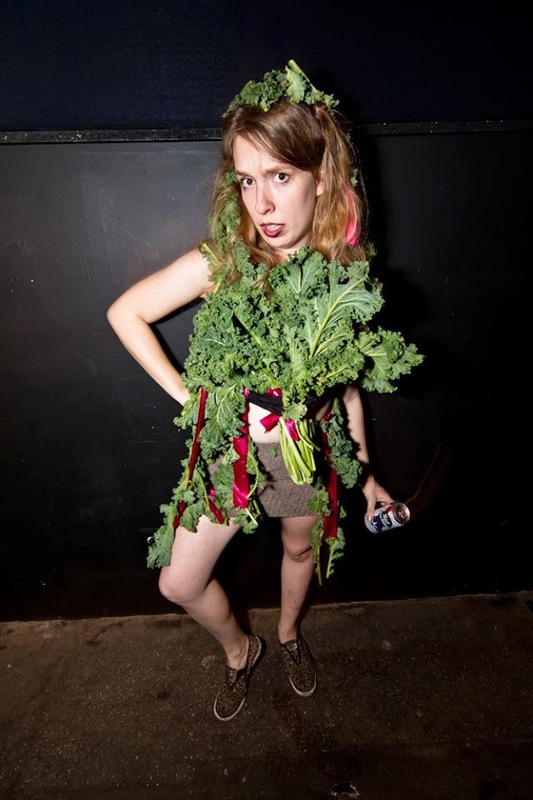 at the Public Theatre) & Kale Girl/Self in many installations throughout Brooklyn nightlife. Why theater? : Because once you start, the party never ends!!! Who do you play in Too Many Lenas 3? : I play Naked Lena. She is literally the Lena "id." She is all want. Tell us about Too Many Lenas 3: Too Many Lenas began as a "chamber play" about Lena Dunhams living in a house together. But it has evolved into a deadpan anti-portrait of millennial effort/ennui. You don't need to have watched GIRLS to "get it." You literally just need to be self-aware, and tuned in culturally, and you must have feelings. What is it like being a part of Too Many Lenas 3? : Working with the cast & team of this show over the past year and a half or so has literally changed my life. It's really inspiring to be in a space with so many unique queer and female voices- making a show, developing a style, worshipping/making fun of bourgie food culture. It really gets me going. What kind of theater speaks to you? What or who inspires you as an artist? : In 2011, I had completely given up on theater, and was living in Los Angeles for the summer when I decided on a whim to see the Rude Mechs' The Method Gun, and it blew me away. I really just love work that feels SPECIFIC TO THE EXACT MOMENT IN WHICH WE ARE EXPERIENCING IT, is aware of the exact surroundings, and plays to the specific audience in the room. I love Celia Rowlson-Hall's work. Basically anything that comes from the tradition of Miranda July. Women who are working across different media. I love Rebecca Patek's work. Half Straddle. The choreography Annie-B Parson is doing for St. Vincent. Women owning zones is my whole thing. Any roles you’re dying to play? : I am working to convince everyone that I actually was a Creative Writing major at Wesleyan (with a Women's Studies minor) by 2016. If you could work with anyone you’ve yet to work with, who would it be? : Honestly, I am DYING to work with Sheila Heti, Margaux Williamson, Misha Glouberman, or basically any Toronto-based artist fictionalized in Heti's How Should A Person Be. Hello, Toronto. Who would play you in a movie about yourself and what would it be called? : Miranda July's shirt from "The Future" (https://www.youtube.com/watch?v=8y0cwsiNFmQ), or a Pusheen (http://pusheen.com/). It would be titled (as was my NYU senior thesis show), "my struggle". What show have you recommended to your friends? : Attending Chris Tyler's monthly show TRL: Total Rejects Live!!! last summer literally changed my life. It is a queer performance party that is ACTUALLY FULLY inclusive, diverse, and "mixed." It is actually subversive, and the performances are both "spectacular" and "thought-provoking" which cannot be said of many other performance parties I have been to in Brooklyn. The show is on hiatus for the summer, but keep your eyes OPEN. What’s the most played song on your iTunes? : I am afraid to check, but it is definitely a sad, whiny indie rock jam. What’s your biggest guilty pleasure? : Anthony Bourdain. What’s up next? : I am pretty much officially retiring from "performance" besides working on Carroll Simmons' next show, Oak Park, but look out for more of my WRITING soon!